The Sprinkler Flow Control Device is a stainless-steel water-flow restrictor that easily installs into the risers of your existing or new irrigation system. 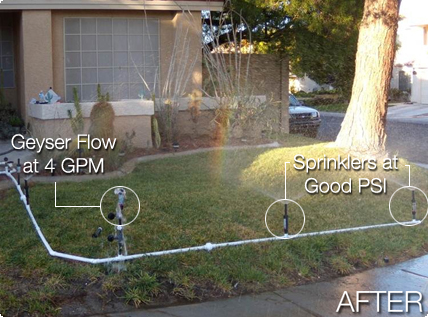 Our patented design reduces the water flow from geysers resulting because of a broken sprinkler head. Did you know that sprinklers best operate at 25 PSI? And that your average household water line runs at 45 PSI? Our patented design reduces over-pressurization of your sprinkler heads and restores optimal pressure to your irrigation system. This revolutionary design can be inserted into your existing system in just 10 minutes per sprinkler. 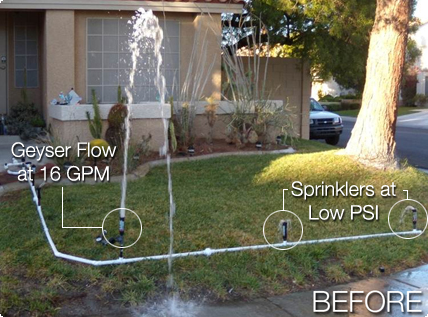 The Sprinkler Flow Control Device reduces your monthly water bill and saves you from potential fines and expensive bills resulting from geysers.